I wanted to reflect on my recent play-test of the General Bonaparte Meets Chain of Command rule set for a day or two. Overall I am very encouraged by the rule set. The Command and Control mechanism as well as the Combat/Firing mechanism are very easily understood and applied. Movement mechanisms are always a little more difficult for me, but these seemed quite simple. Finally is it Napoleonic, well I am no expert but it seemed just as Napoleonic as any other ruleset I have played. I really like the Passage of Lines and Regulating Battalions rules which make me feel like a Napoleonic General in control of his troops. It would also seem that the special army and period Tactical Bonuses offered by rolling 5 and 6's on the Command Dice will really add some chrome. The play-test includes only the Bonuses for the French, Russian and Austrian armies during the revolutionary period, I am already think about some Tactical Bonuses for the Napoleonic Wars like Pas de Charge (add 1d6 movement/+1shock for a French Attack Column closing to combat) or Reverse Slope (increasing the to hit dice by artillery by 1). Gap between Units: I find it hard to manage movement when units are pushed up against each other. Aside from AC's under a Regulating Battalion order, I believe that their should be a personal space rule of 1"
Support in ZOC: I believe the rules say all the bases in an unit that has it's ZOC invaded offer support. I am not sure if this is correct, look at this situation. It would seem that only 4 of the bases should offer support to me. ADC Movement, this is a great addition to the game, move at 3d6 +3" per die carrying one activation to another officer but do they just automatically rejoin their Divisional General once the message is delivered without diced movement? Regulating Battalions formations, I think the battalions all have to be in the same formation, ie. line or AC in order to issue this. But in a 4 battalion regiment can the colonel just order 2-3 of the battalions to move in formation? Deployed Skirmishers ZOC. I am presuming that ZOC of 3" is from the front edge of the SK bases. Deployed Skirmishers and Columns of March. Can you have deployed skirmishers when the parent unit is in March Column, does not seem right but I thought I would check? Movement of columns, I am presuming that March Columns can snake about the terrain at 3d6? The rules specifically point out the limitations and penalties for formations in Line but nothing is mentioned about Attack Columns, do they act like March Columns. Overlap in Combat. I thought I saw that there was a one base overlap in the rules but now can not find it. How many bases are in combat on each side in the following illustration. 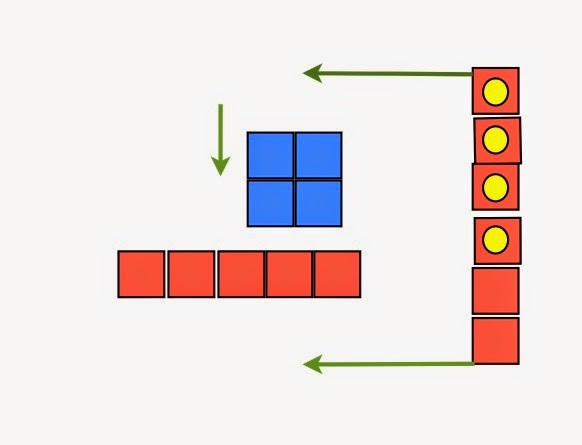 Is it 7 for red and 8 for blue or is there are overlap rule of 1 base so 6 for blue and 6 for red. I suppose you can say what are the pros of these rules. Well I think they are an excellent ruleset as written, they need some clarification as discussed above and maybe some added or polished chrome. But it was impressive that two wargamers, albeit experienced, were able to take this ruleset and have a game with very little knowledge of the specific rules. One play-tester had not played Napoleonics before and the other play-tester's Napoleonic experience was with Column, Line and Square, a ruleset I believe in it's own category! It certainly helped that we were all CoC players. But there was really very little referral to the rulebook and we were able to play from the QRS only. I am really quite excited about these rules, but I suppose the real test will be with experienced Napoleonic gamers. That group is a tough sell. Very Interesting, I look forward to hearing and seeing more. Excellent report John! I'm very keen to give these a try. Thanks for keeping us all in the loop. I will look forward to hearing tour opinion. Interesting review John. Can't wait to see more on these rules. How well does it cater for skirmishers? That's often a make or break for me regarding Napoleonic rules.